Accreditation is a procedure that universities seek to complete in order to bring their academic programs up to higher standards. The process of accreditation is non-governmental and voluntary; that is, universities appear before a private, regional or professional association and submit an application. Distance learning universities do not usually share the same accreditation criteria that traditional universities do. 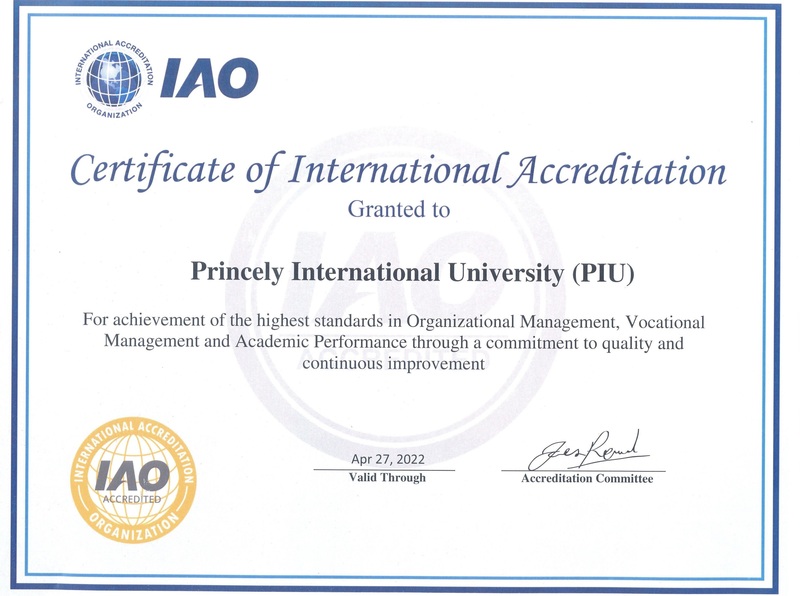 PIU has been granted IAO certificate of International Accreditation for achievement of the highest standards in Organizational Management, Vocational Management and academic Performance through a commitment to quality and continuous improvement. Your Princely diploma and academic transcripts can be internationally validated by the Apostil from The Hague. In accordance with the resolutions reached at The Hague Convention, diplomas, certificates and transcripts issued by universities in one country can be officially legalized in other countries. The cost of each Apostils is to be added to the tuition fee. The key to maintaining a good reputation is in the admission process, study monitoring and student follow up. We have an excellent reputation on both three levels. We strive at Princely to make sure that all our graduate students are from the best working adults. Most modern companies believe that a degree obtained by correspondence is as valid as a degree obtained by attending classes regularly. This is because the graduate who possesses a degree obtained this way has demonstrated that he is self-motivation with a desire to improve himself. The degree programs offered at Princely are widely recognized. However, if a PIU graduate wishes to pursue his/her education at any other university, he/she should first ensure that the obtained credits will be transferred.